Although it’s not based on a video game, the many action sequences in former stuntman-turned-director Chad Stahelski’s John Wick is as close to a movie version of a video game as it’s possible to get. The title character shoots his assailants with ruthless efficiency at a furious rate, often interrupting the shooting of one man he has pinned to the ground in order to drill bullets into a number of his accomplices. The shootings are largely bloodless – delicate sprays of crimson barely glimpsed in the midst of the action, and the victims forgotten the moment they’re dispensed with. This choreographed violence is a complex dance performed to a grinding rock track that’s loud and tuneless; it’s visceral stuff, and it delights in its own absurdity. 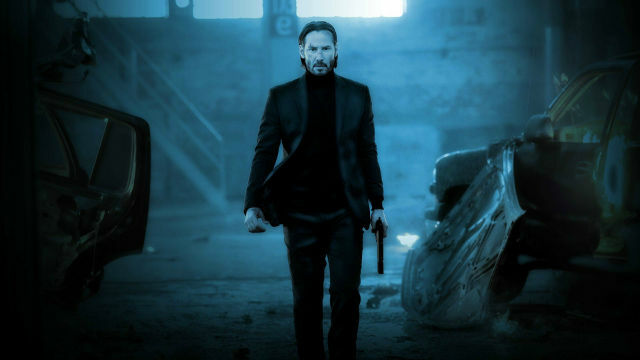 Yet, somehow, despite the video-game kills – it’s tempting to glance at the top right corner of the screen to see the points total – John Wick hides its audacity beneath a cloak of solemn sobriety, only tacitly acknowledging the fact that it’s a knowing celebration of the absurd excesses of the modern action thriller. Wick (Keanu Reeves – Chain Reaction, The Matrix) is the hoariest of genre stereotypes – the retired hitman who finds himself sucked back into his old ways by former associates. When the wife for whom he gave up the profession falls terminally ill, she arranges for a puppy to be delivered to him after her death to provide him with hope for the future. So you can just imagine how he responds when Iosef Tarasov (Alfie Allen – Flashbacks of a Fool, Confine), the son of a Russian gangster (Michael Nyqvist – Abduction) for whom Wick used to work, kills the puppy while stealing the former hitman’s Dodge Charger car. It’s strange, but somehow, killing a man’s puppy feels like a bigger crime than killing his woman, and Wick’s thirst for vengeance knows no bounds. It doesn’t take long for him to track Tarasov junior down and to engage Tarasov senior’s vast army of henchmen in a series of bloody shootouts. Stahelski, working from a script by Derek Kolstad, places John Wick in a world that bears similarities to our own but in which the police seem to play no part and a loose cabal of assassins find refuge from the stresses of the profession in The Colonial, a hotel that caters exclusively to its members. It’s knowing, tongue-in-cheek departures from the real world such as this that suggests John Wick is more of a slick parody of movies which invite admiration of men or women who kill people for a living than an addition to their number. The plot is really of no importance, serving merely as a reason for all the gunplay which calculatedly provokes visceral stirrings amongst the fans of this kind of thing in the same way that bad men killing cute puppies arouse our outrage. In that respect, John Wick is as clever and cynical a movie as you could wish to find: it searches for the buttons, finds them, then pushes repeatedly.